Last week, two Arizona teenagers announced they are organizing a march on March 24 to advocate for gun control, in solidarity with survivors of the recent mass shooting in Florida. After survivors of the Parkland shooting announced that they are organizing an event in Washington D.C. called March For Our Lives on March 24, Samantha Lekberg, 16, of Surprise, and Jordan Harb, 17, of Mesa, paired up to plan a sister march at the state Capitol. More than 11,000 people have expressed interested in their “#MarchForOurLives Phoenix, Arizona” event on Facebook. This week, they released a statement through their PHX March For Our Lives page. House Bill 2299 would require a person on probation for a domestic-violence offense to hand all their firearms over to a law-enforcement agency for the duration of their probation. HB 2023 would ban bump stocks and other devices designed to make semi-automatic weapons fire similarly to fully-automatic weapons. HB 2024 would require universal criminal background checks for people buying firearms. It would close the so-called “gun show” or “private sale” loophole by requiring a private person selling or transferring a firearm to go through a licensed firearm dealer, with some exceptions. Licensed dealers are required to run background checks. Senate Bill 1347 (and the identical HB 2140) would create a process where immediate family members or a police officer can petition a judge for an injunction to prohibit someone with mental-health issues from possessing a gun. They also released a petition for people to sign in support of their demands. All of these bills were introduced by Democratic lawmakers. Republican leadership has refused to give any of the bills the public hearings they need to advance, and the deadline for such a hearing has now passed. Last week, Democrats in the Arizona House of Representatives tried to force a vote on legislation that would ban bump stocks and other devices used to make guns fire more rapidly. They failed, as they have in all of their attempts to impose gun control measures in the Legislature both this year and in recent years. Now, the bills cannot advance without a special procedural motion like that one that failed last week, which is unlikely unless six Republicans change their minds and support another procedural move. There is another option: Governor Doug Ducey could call for a special session to address “The Arizona Agenda for Our Lives.” This would require true leadership on his part, so good luck with that. True leadership is in short supply from our governor and our Tea-Publican legislature. Sister Marches are being organized on Facebook. Here is a brief list of the sister marches I was able to find. If you know of others in Arizona, please post a link and info in the comments. 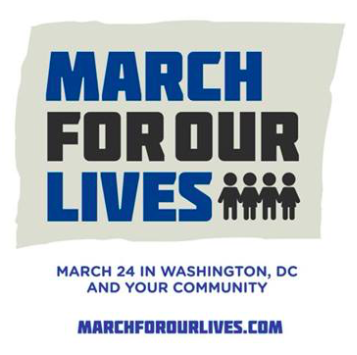 March For Our Lives – Tucson Saturday, March 24 at 11:00 AM, Jacome Plaza Tucson, 10 West Pennington Street, Tucson, AZ. March For Our Lives – Prescott Saturday, March 24 at 12 PM, Courthouse Square, Prescott, 120 South Cortez Street #103, Prescott, AZ. Previous articleWhy Do We Tolerate a Gun Expo on Public Property?